Biotin is an essential vitamin for the body. In this article, we will explain biotin health benefits and the importance of maintaining a good level of biotin. Eat and give comfort to the body. Biotin (also called vitamin B7, B8 and H) is a water-soluble vitamin that is part of the vitamin B complex. These are a group of essential nutrients needed for metabolic, nervous, digestive and cardiovascular functions. This vitamin is a fundamental coenzyme for our body since it helps us to metabolize fats, carbohydrates, and amino acids. In addition, it is responsible for converting glucose into energy. Therefore, it plays a very important role when it comes to carrying out physical activities and maintaining adequate psychological functioning. It also helps maintain healthy skin cells or nails and is also a direct agent of the creation of hemoglobin. One of the ways to have a good level of biotin is through food. The consumption of these foods will help you maintain a good level of biotin. Here we will explain the biotin health benefits for your body. Biotin is known to have a large number of properties that favor hair. Thus, it contributes to strengthening, growth and gives it greater brightness. Therefore, the consumption of vitamin B7 or biotin as a natural supplement can be beneficial in the face of hair loss. All in all, it is best to always consult our doctor before you start taking supplements. In the day to day, we live under a lot of stress and some anxiety, whether for work, family or other reasons. It is normal in life, but high levels of stress or anxiety can lead to serious problems. Consuming foods that contain biotin can help us fight stress and reduce fatigue and sadness. The absence of vitamins in our body can promote depression because it causes weakness. Therefore, it is recommended to include biotin and other nutrients in our daily diet. This can be a good complement to the treatment we are following if we suffer from chronic depression. It is essential in our body since it helps to accelerate our metabolism and, therefore, to improve intestinal functioning. 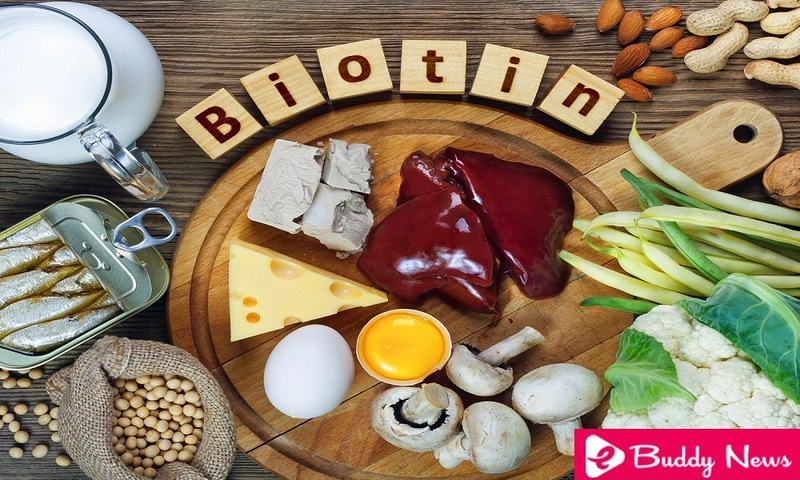 One of the biotin health benefits is that it is responsible for leveling the metabolism, as well as the production of carbohydrates, proteins, and amino acids. Biotin can work as an analgesic and relieve muscle pain. Maintaining a good level of biotin will help you perform exercises and create a greater sense of well-being. Eat healthily and exercise: your body will appreciate it. The intake of biotin has many benefits for the skin. For example, when eating foods that contain this vitamin, we will be helping to combat dermatitis. This is due to its analgesic properties that help relieve irritation. In addition, this enzyme also helps us reduce stress, one of the possible causes of dermatitis. It also allows to combat dry skin and prevent irritation, cracking or other skin infections. It is important to note that excessive consumption of biotin can cause acne especially in the face area, so it should not be abused. You must be careful with the consumption of fats to avoid the appearance of acne. It is best to always go to the doctor to recommend the most appropriate dose. The lack of biotin in our body is related to the risk of anemia. This vitamin contributes to the creation of hemoglobin and therefore also adjusts blood levels in the body. In addition, biotin facilitates the generation of energy through glucose, so it would help prevent diabetic neuropathy. Also, blood circulation can also improve with the consumption of biotin. As with our hair, biotin helps in the health of our nails. This is because the cells responsible for its growth regenerate thanks to this vitamin. Biotin benefits the health of the nervous system due to its role in nerve signaling and neurotransmitter activity. Thus, it influences the function of memory and defends us against cognitive deterioration related to age, such as Alzheimer’s disease or dementia. However, although this vitamin can help us in different areas of the body, having an excessive level of biotin can be harmful. In some people, it can generate allergic reactions, stomach pains, diarrhea, and mild nausea. In addition, diabetics should not consume biotin in excess because it increases glucose and fatty acids in the body. It is best to consult our doctor before starting to take biotin supplements. This can be very beneficial but in adequate amounts.